If you know a tea lover, then a tea based gift seems like an obvious choice. Like most tea lovers though, they might be a little addicted and already have too much tea. That's not true by the way, you can never have too much tea. However, I can understand not wanting to add to their mounting collection, so here's some non-tea options to consider! Because. Hello! Chocolate! Take a little risk and go for tea infused chocolate. It's becoming more and more popular, meaning you can source it from a growing number of brands. Ombar have a Lemon and Green tea, (personally not a fan) and Prestat have a whole Earl Grey collection which includes chocolate bars and truffles! Easy Teasy have a colletion of 6 tea infused chocolate bars, while The Tea Room has a HUGE collection of 13 bars! Average Price: Usually under £5, but up to £15 if your pushing the boat out. These can be fun, entertaining and come in pretty much any form, ranging from a submarine to a flower to a pug! You’re bound to find something your tea lover will enjoy. Average Price: Under £10, but over £5. Something a little different. Again these are another fun and entertaining gift, available in a number for formats, including origami and fish! Tea often gives out great aromas, helping to relax and invigorate, meaning that many tea lovers feel a deep connection to smell. Why not try something different with a teacup candle or a teapot oil burner by pretty paper packages. Perhaps your tea lover is also a book lover or simply just has a thirst for knowledge. There are all manner of tea books out there, from the traditional ancient classics, modern overviews and cook books! Check out these top 10 tea books for ideas. Average Price: Under £20, some even under £15. You can also get a whole range of beauty products infused with tea! Incredible! This include; soaps, bath salts, moisturisers, face masks, bath bombs and lip balm! Click the links to take a look! Some of the brands include Ooliva, Beach House Tea and Pin Wheel. A useful gift for those hot summer days. You can also get thermos brewers which will keep tea cold (or hot) for longer! Average Price: Between £15 and £30. Tea based or scented perfumes have hit mainstream in the last few years. Elizabeth Arden released Green Teain 1999, but saw a surge in popularity with the expansion of the Green Tea collection. Earlier in 2017 Jo Malone joined the tea train with the release of a Rare Tea scents collection. However, there's also a cruelty free collection by Ravenscourt Apothecary. This isn’t just a kettle. This is the kettle. 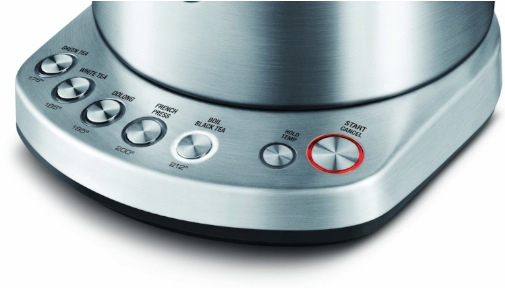 A kettle that operates at the required temperature. If you’re not a tea lover yourself, you may not know that different teas need to be steeped at difference temperatures to create the best flavours. These kettles help you get the right temperature with ease! Average Price: As little as £30 or as much as over £200! Ok, so this is technically tea and a bit of a cheat item to add to the list, but it’s a truly creative gift. You can even get special caffine free, chai and bubble tea kits. Much converted, very beautiful and a tad pricey. Is it worth it? Yes, it’ll be loved forever. Average Price: Traditionally £55+, but if you look carefully you can find some around the £30 mark. A fun and educational experience that any tea lover is bound to enjoy, especially those who are hands on and creative. Average Price: Between £30 and £60.